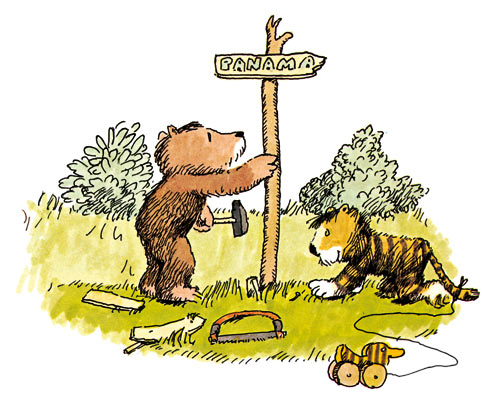 If you've followed my blog for a while now and have read our engagement story, you know that the children's book characters Little Bear and Little Tiger are pretty important to us. After we watched our little baby bounce and dance around on the ultrasound for the first time, Andrew wrote the little poem below and I just thought it was the sweetest. One little bear came running 'round the bend. "Running is really great," he thought "but I'd love a little tiger friend." she made little bear so happy, he could never wear a frown. marriage came soon after and the choirs sang above. They got a little cottage and they cleaned it up so nice. They never left it dirty and they never got in fights. little tiger was waiting and gave his ear a jerk. "Great news," she said while jumping, just happy as could be. "Now our little cottage is going to hold three."